We propose a nearly lossless, compact, electrically modulated vertical directional coupler, which is based on the controllable evanescent coupling in a previously proposed graphene-assisted total internal reflection (GA-FTIR) scheme. In the proposed device, two single-mode waveguides are separate by graphene-SiO2-graphene layers. By changing the chemical potential of the graphene layers with a gate voltage, the coupling strength between the waveguides, and hence the coupling length of the directional coupler, is controlled. Therefore, for a properly chosen, fixed device length, when an input wave is launched into one of the waveguides, the ratio of their output powers can be controlled electrically. The operation of the proposed device is analyzed, with the dispersion relations calculated using a model of a one-dimensional slab waveguide. The supermodes in the coupled waveguide are calculated using the finite-element method to estimate the coupling length, realistic devices are designed, and their performance was confirmed using the finite-difference time-domain method. The designed 3 μm by 1 μm device achieves an insertion loss of less than 0.11 dB, and a 24-dB extinction ratio between bar and cross states. The proposed low-loss device could enable integrated modulation of a strong optical signal, without thermal buildup. G. T. Reed, G. Mashanovich, F. Y. Gardes, and D. J. Thomson, “Silicon optical modulators,” Nat. Phot. 4, 518-526 (2010). F. Bonaccorso, Z. 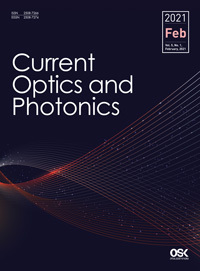 Sun, T. Hasan, and A. C. Ferrari, “Graphene photonics and optoelectronics,” Nat. Phot. 4, 611-622 (2010). J. Gosciniak and D. T. H. Tan, “Theoretical investigation of graphene-based photonic modulators,” Sci. Rep. 3, 1897 (2013). X. He, “Tunable terahertz graphene metamaterials,” Carbon 82, 229-237 (2015). S. H. Lee, M. Choi, T.-T. Kim, S. Lee, M. Liu, X. Yin, H. K. Choi, S. S. Lee, C.-G. Choi, S.-Y. Choi, X. Zhang, and B. Min, “Switching terahertz waves with gate-controlled active graphene metamaterials,” Nat. Mater. 11, 936-941 (2012). M. Liu, X. Yin, and X. Zhang, “Double-Layer Graphene Optical Modulator,” Nano Lett. 12, 1482-1485 (2012). M. Liu, X. Yin, E. Ulin-Avila, B. Geng, T. Zentgraf, L. Ju, F. Wang, and X. Zhang, “A graphene-based broadband optical modulator,” Nature 474, 64-67 (2011). R. P. Webb, R. J. Manning, G. D. Maxwell, and A. J. Poustie, “40 Gbit/s all-optical XOR gate based on hybrid-integratedMach-Zehnder interferometer,” Electron. Lett. 39,79-81 (2003). T. Baba, S. Akiyama, M. Imai, N. Hirayama, H. Takahashi, Y. Noguchi, T. Horikawa, and T. Usuki, “50-Gb/s ring-resonator-based silicon modulator,” Opt. Express 21, 11869-11876 (2013). W. Xu, Z. H. Zhu, K. Liu, J. F. Zhang, X. D. Yuan, Q. S. Lu, and S. Q. Qin, “Toward integrated electrically control-lable directional coupling based on dielectric loaded graphene plasmonic waveguide,” Opt. Lett. 40, 1603-1606 (2015). T. Q. Tran, S. Lee, H. Heo, and S. Kim, “Tunable Wide-Angle Tunneling in Graphene-Assisted Frustrated Total Internal Reflection,” Sci. Rep. 6, 19975 (2016). J. U. Knickerbocker, P. S. Andry, B. Dang, R. R. Horton, C. S. Patel, R. J. Polastre, K. Sakuma, E. S. Sprogis, C. K. Tsang, B. C. Webb, and S. L. Wright, “3D silicon integration,” Electron. Components Technol. Conf. 2008. ECTC 2008. 58th 538-543 (2008). A. W. Topol, D. C. L. Tulipe, L. Shi, D. J. Frank, K. Bernstein, S. E. Steen, A. Kumar, G. U. Singco, A. M. Young, K. W. Guarini, and M. Ieong, “Three-dimensional integrated circuits,” IBM J. Res. Dev. 50, 491-506 (2006). D. H. Kim, K. Athikulwongse, M. B. Healy, M. M. Hossain, M. Jung, I. Khorosh, G. Kumar, Y.-J. Lee, D. L. Lewis, T.-W. Lin, C. Liu, S. Panth, M. Pathak, M. Ren, G. Shen, T. Song, D. H. Woo, X. Zhao, J. Kim, H. Choi, G. H. Loh, H.-H. S. Lee, and S. K. Lim, “Design and Analysis of 3D-MAPS (3D Massively Parallel Processor with Stacked Memory),” Comput. IEEE Trans. 64, 112-125 (2015). F. H. L. Koppens, D. E. Chang, and F. J. García de Abajo, “Graphene Plasmonics: A Platform for Strong Light-Matter Interactions,” Nano Lett. 11, 3370-3377 (2011). S. Campione, I. Brener, and F. Marquire, “Theory of epsilon-near-zero modes in ultrathin films,” Phys. Rev. B 91, 121408 (2015). C. T. Phare, Y.-H. Daniel Lee, J. Cardenas, and M. Lipson, “Graphene electro-optic modulator with 30 GHz bandwidth,” Nat. Phot. 9, 511-514 (2015).